Looking for an affordable, non-plastic cup for your babe? 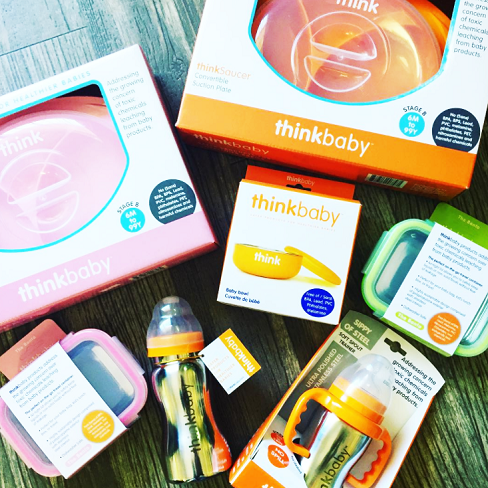 Look no further than Thinkbaby's innovative design and no drip spout, all in a stainless steel cup. Even when held upside down, it doesn't leak! Easy to hold handles are sure to please your toddler as they transition from a bottle to a cup. No spill spout - features their cross-cut design. Think stainless steel is heavy? Think again! This sippy weighs about the same amount as their plastic bottle! Why choose Thinkbaby? One great reason is that their extra soft, medical-grade silicone spout provides easier transition from baby bottle feeding to sippy cup. Thinkbaby has won multiple awards based on the ease of transition of their line. The Thinkbaby Sippy of Steel comes with a travel top. Pop it on when in transit; keep the crud and gunk out! When you are ready to upgrade to a straw cup, all you need is a new top! You can convert to a straw top by purchasing the top here. The Thinkbaby Sippy of Steel is best for children ages 9 - 36 months. Top shelf dishwasher safe or hand wash.